Escape From Falstaff’s Island is a Twine piece about a technical writer named Ruby who has to decide whether to stay in an overworked position or go off on vacation. As one might expect with that introduction, the game branches early and massively. Mildly spoilery thoughts follow. The first time through I played the “stay in the office” set of paths — I’d just come off of playing a number of other IF games set in the workplace, and was curious how this one would compare. DeFord casts Ruby as a competent woman who is constantly condescended to and borderline harassed in the workplace, and as the victim of various irritating bits of office politics; in one ending, her disagreement with a coworker even (rather implausibly) escalates to violence. Throughout this passage I felt as though the situation was being sketched rather cartoonishly. Women do wind up being harassed or talked down to in many technical workplaces, but in my observation, and the anecdotal data I’ve heard from female friends, it’s typically in a subtler way than this. I also felt repeatedly that I wished I could make Ruby take some alternate courses of action between aggressiveness and passivity: for instance, when asked to postpone her vacation, she might perhaps have tried to trade her cooperation for some workplace concessions, like a raise or the promise of more extensive vacation later. When she and the other woman in her workplace were put in a bad position, they could potentially have discussed their response together rather than going into the situation unprepared. Admittedly, it’s not necessary always to give a character all the same options she might have in real life, and indeed it can be a means of characterization to show that a character thinks she’s trapped between undesirable alternatives, even if she really isn’t. The storyline is completely different if Ruby takes her vacation, and a bit longer as well, but it turns out that that also involves themes about gender and female competence. It turns out that Ruby’s booked her vacation on some sort of game-show-like adventure vacation island where you have to fight your way past assorted traps in pursuit of treasure. In contrast with the situation at work, where she simply wasn’t given credit for her competence, on the island she genuinely has no clue what she’s doing; lacks physical strength, dexterity, or observational powers; and gets trapped repeatedly. This made me a little exasperated with her as a character, not so much because she’s bad at coping with pit traps (I’m sure I would be too), but because she for some reason decided this was a good kind of vacation to go on given her skill set, and the story makes it clear that she didn’t read the fine print about the adventure very carefully. (And she a technical writer.) I think it would have been possible to motivate this choice of hers much more sympathetically. Eventually Ruby encounters a man who is a potential romantic partner, but who is fairly dismissive of her in the early stages of their encounter (I didn’t exactly take to him). There’s also, in some paths, a lesbian couple who partake of some unfortunate stereotypes. So overall I think this piece is not well-served by its early branching and thematic variability. It’s not quite a Cave of Time in its structure, but it is fairly branchy and not all of the branches are very well related. 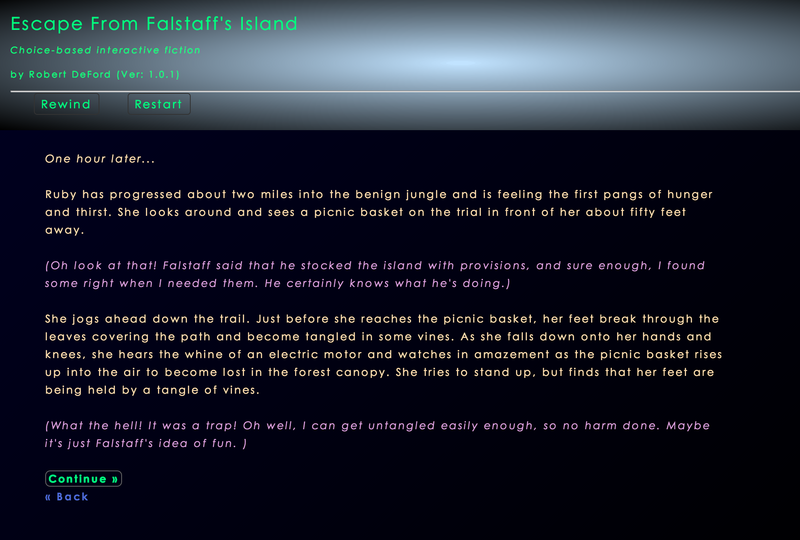 Some of the routes through Escape From Falstaff’s Island are standard adventure fare, complete with an exaggerated happy ending. Others felt like this was instead meant to be an exploration of sexism, but a rather broadly painted one that didn’t capture many of the nuances of what this is actually like. Which leads me to a more general point. I have observed that when authors want to crank up the emotional power of a scene, they sometimes think they need to make that scene more extreme. It’s bad if someone makes a mildly sexist comment, so obviously it will be worse if they make a very sexist one. It’s bad if someone gets bruised, so obviously it will be worse if they break an arm. Etc. But often this escalation takes the scene into the territory of cartoonish exaggeration, where it gets harder for the reader to believe in what’s happening, and the result is emotional detachment rather than sympathy or engagement. What works better, at least for me, is to intensify by making the scene more specific, more exactly observed, less stereotyped. Don’t make the event more severe; make it more real. The results will be much more powerful. Thanks for the review Emily. Your comments parallel almost exactly the comments made by my favorite beta tester, comments which I decided to ignore because I thought I knew better. Ha! After being hit with the same critical input twice, even I can see things objectively. He was right, and I hope he is reading this review and feeling vindicated. Thanks again.